Although the banking and financial sector is recovering from its downturn in the last decade, they now face new challenges. Their challenges range from new customer relationships with banks to energy management in banks. Read on to catch up. If you work in the banking sector, you will have already heard about millennials, the generations born after the 80s that reached maturity from the year 2000. The challenge for the banking sector is to adapt to a population that doesn’t remember a world without the Internet or without a mobile phone in their hand. It also changes the way we communicate: new customers have social networks as a meeting point. And, of course, it changes what they want the bank to communicate to them. For example, they care about whether the bank is efficient and sustainable. 25% of the population in the UK belongs to the millennial generation – specifically 17 million people. In addition, it is estimated that by 2025 millennials will account for more than 70% of the workforce in the developed world, a figure which should be taken into account when planning long-term strategies. Here you have already 3 challenges in 1. Digitalisation of processes that banks performed slowly and analogically. Do you know that the banking sector is still in 40% of its digitalization process? What is the relationship between cryptocurrency and banks? Of course, the key is in customer service: Should the bank accept Bitcoin as a saving or payment method, etc? And as a source of income in ATMs or currency for the e-wallet? Despite how juicy such a volatile and speculative market may seem for a bank, it has its challenges. These are technological, specialisation and, of course, security. Many voices in the banking sector renounced Bitcoin after the scandals of the massive cyber attack in South Korea . Another example of a security challenge is the case of the UK, where losses due to online banking fraud in 2015 reached a total annual value of 133.5 million pounds. The leader in security. If banks manage to implement blockchain systems for monetary operations, we may never again see news like that of Mexican cyber attacks. The second in terms of competition: Will a self-managed co-financing network for citizens based on blockchain technology be the bank of the future? It can also be applied in other areas of banking work, streamlining the contracts and interactions carried out between the client and the bank, automating the transaction of the contracts and executing them as agreed. Now that you already know the general challenges, let’s get into the energy management challenges for banking. It is estimated that the energy expenditure for the annual banking and financial sector worldwide exceeds 10 billion pounds. The energy dependence of current technologies, which are fundamental for the digitisation of the banking sector and its survival. Digital and electronic technology on which banking services and products basically depend are unable to function without energy. The volatility of energy prices, which have a tendency to increase, are impossible to control or predict accurately without having the right tools. Those responsible for energy management must make their monthly assessment and planning of the energy purchases they will need for the following month, and this must then be accepted by managers so that the final price can be closed with the utility company. Achieve fast and timely managerial approval. To achieve this, it is necessary to provide specific numerical data in a simple and visual way. Get a competitive price from the utility companies to achieve the lowest possible cost. Here the key is to make a correct analysis of the data that the market gives us and make the purchase decision at the right time – prices can increase up to three times if you don’t act fast. The identification of the energy saving potential of each of the buildings owned by a bank. It must be taken into account that banking entities belong to the group of companies identified as multi-location, where each building is like “a tailored suit”. These singularities by type of building, geographical area and activity will affect energy consumption, and for the energy manager, the challenge is knowing how to identify them in order to discover the saving potential of each building. Banks, savings banks and financial services companies have branches and central offices that are located in different geographical areas. In addition, each of these buildings is dedicated to different activities and will have different types of equipment installed according to their particularities. Maintenance of facilities: Proper maintenance of the facilities is vital for saving costs. Banks that have a good maintenance plan for their buildings and facilities ensure energy savings and improvements in energy efficiency. 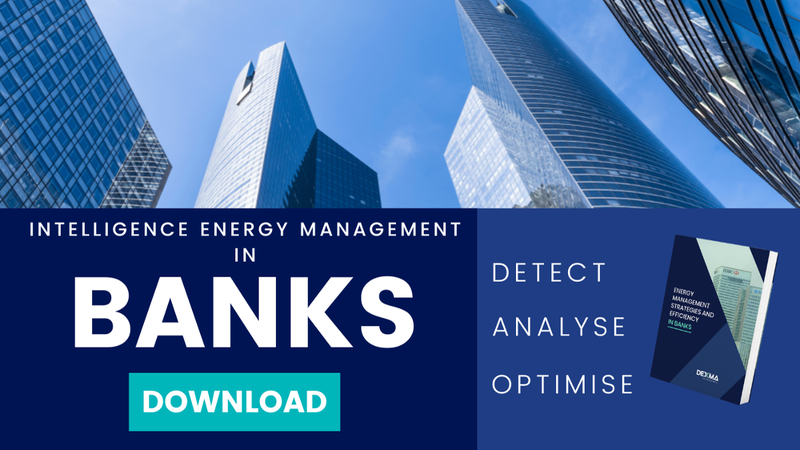 The challenge for the banking sector is to implement methodologies that better accompany energy management such as predictive maintenance, which is based on the measurement and monitoring of the condition of the facilities. If they succeed, they will achieve high energy costs savings. For example, the PRÓTYPO Project lead by DEXMA aims to build a tool that helps energy management based on the predictive maintenance methodology. In addition, proper maintenance of the facilities and offices will ensure the comfort of employees and customers. Finally, the digitisation of the processes that maintenance requires is part of the challenge. The need to analyse a huge volume of energy data (Big Energy Data) from thousands of locations. Although the banking industry has experience working with Big Data on a financial level, dealing with Big Data from energy data is not precisely its speciality. If the banks manage to apply the advanced analysis technologies for large volumes of data, they will reduce their operational costs while guaranteeing the security and reliability of the data (this article by Juan Carlos Fernández, one of our data scientists, tells you why the quality of the energy data is so important). The emergence of rankings and sustainability indexes as a key reference for investors. One example would be the Dow Jones Sustainability Index (DJSI): an index that rates companies worldwide with respect to each other, based on social, environmental and economic criteria. This index selects the 320 companies with the greatest social responsibility from among the 2,500 largest companies in the world. 34 British companies appear in the 2018 edition including banks such as Barclays PLC and Royal Bank of Scotland Group PLC. The banking sector has realised the importance of paying attention to non-financial issues such as sustainability and efficient energy management.